Crosby vs. Ovechkin (Game 7). Photo from The Season Pass. Alexander Ovechkin versus Sidney Crosby. 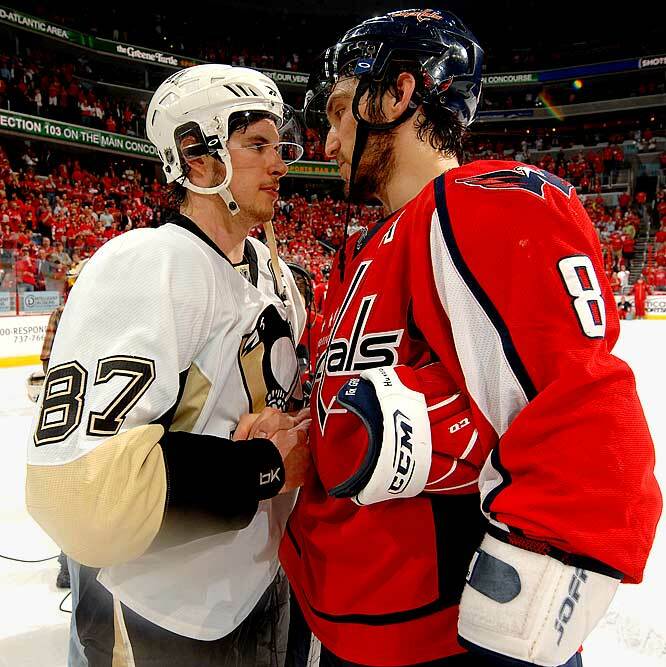 Sidney Crosby versus Alexander Ovechkin. The debate itself and the polarization created by both players is a rivalry that any sport would kill for. They are the marketing world’s perfect storm as far as the NHL is concerned. As any hockey fan knows, there is a strong dividing line between Team Ovechkin and Team Crosby, almost as fierce as the dividing line between Team Edward and Team Jacob for the Twi-hards (I hate that I know what that even means). There are websites dedicated to comparing the two by stats and blog discussions galore trying to defend the honour of each player. What I intend to draw attention to in this post is not anything that happens on the ice (I should probably come clean and say I am definitely an Ovechkin fan), but rather the debate that surrounds both players and how they are constructed and talked about. Crosby is the Ivy League, scholarly centre, while Ovechkin is the big-school, big-campus, fraternity boy left-wing. Crosby is a movie star, Ovechkin is a rock star. Ovechkin is like a tornado on the Ice that will simply blow you away. Crosby on the other hand is like a river quiet and consistent. He just keeps coming and will wear you down. Crosby is a much better team player, and will always be the best in the world. Ovechkin is a lazy and selfish, yet talented player and nothing more. If ovechkin was canadian, i truly believe that we wouldn’t talk about crosby the way we do now. I agree, and think that Ovechkin would probably far outshine Crosby in the fame department if he were Canadian, mostly because Ovechkin fits better with the notion of hockey masculinity. However, that just shows you how flexible our loyalties can be and that this debate is heavily premised on cultural and political histories more so than flash versus substance. ← Hockey and Militarism: What’s the Connection and Why Does it Matter? Great post. I certainly have been intrigued by how these two superstars have been juxtaposed/compared dating back to their days in the World Juniors. With Crosby slow to come back from his concussion, it appears that the NHL marketing machine might not take too much time to find another mild-mannered Canadian star to place in oppostion to Ovechkin (Head over to TSN.ca and you can find the headine, “Stamkos, Ovechkin go head-to-head tonight on TSN2”). The irony to be found in all this is how the Cold War rhetoric that constructed the Russian Other as robotic, well trained and humourless in the 1970s (think Summit Series) has been replaced in the national discourse by Ovechkin’s “over-the-top” embodiment of Russian-ness: undisciplined, lazy, and wild. Apparently the commercials featuring the two players fall along similar discursive lines to the ones you’ve identified here.